The St. Joseph House of Formation is a fairly new addition to Wichita and Newman University. 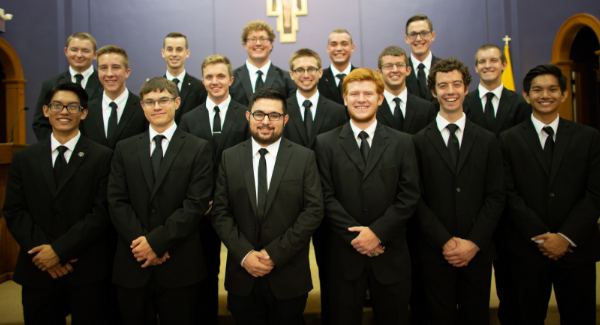 The number of seminarians in the program is growing each year and so is the presence of the seminarians on the Newman campus. You may have seen them playing Frisbee on the campus lawn or attending campus events, and if you haven’t seen them there, you’ll definitely see them at the Jets athletic events. What’s important to know about the seminarians is that they are approachable, kind and funny. This year, there are 16 men in the St. Joseph House of Formation. 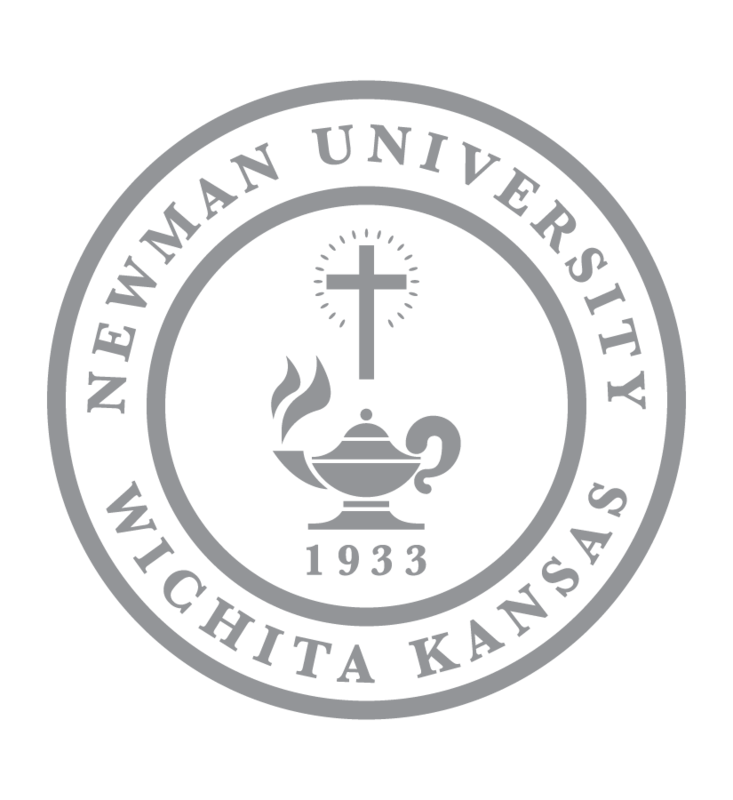 They attend Newman University with the goal of obtaining their bachelor’s degree in philosophy before moving on to obtain their master’s degree in divinity elsewhere. Each has a unique reason for joining Seminary. 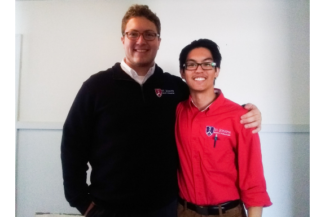 We spoke to seminarians Matthew Nguyen and Cole Schneiders to get their story. Matthew Nguyen is in the midst of his third year as a seminarian and his second year at Newman. On his trip from California to Kansas in 2008, he remembers meeting a priest whose kindness changed his life forever. 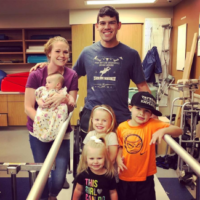 His family was moving due to the recession and trying to save as much money as possible. 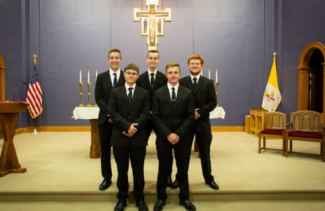 Cole Schneiders is new to the seminarian program and only decided in May that he wanted to join. Last year, Schneiders was at Kansas State University. He was content, he thought. 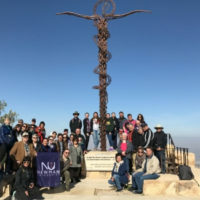 Last spring, Schneiders decided to go on a spring break retreat with other college students to do charity work and visit a monastery. Both agreed their faith life has been “‘a roller-coaster ride,'” as it is for most. “I haven’t been a hero of the faith or anything,” Schneiders said. “Whether we become priests or not, the Diocese is happy to support men trying to become better men for the sake of God,” added Schneiders. The long application process to join seminary took Nguyen eight months but Schneiders’ was rushed due to the quickly approaching school start date and took only three months. The application includes a drug test, a psych evaluation, conversations with the vocation director about your life, relationships, prayer life and more. “Everything is paid for so there is an expectation that you will have the work ethic and the right intention for joining,” said Schneiders. 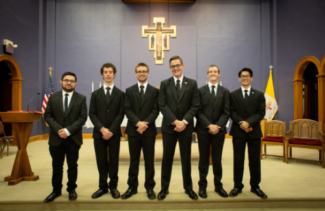 The seminarians lead a fairly normal college life: going to class, meeting new friends and getting little sleep, but each day, structure and growth in their faith is prioritized. A typical day for the men in the St. Joseph House of Formation begins around 5 or 5:30 a.m. The group has morning prayer at 6:30 and daily Mass at 6:45. They share breakfast from 7 to 8 and typically attend classes from 8 a.m. to 3 p.m.
Adoration begins at 4 p.m. followed by dinner. The men cook dinner in teams of three and each team gets a turn to cook dinner one night a week. After dinner, there is free time to play games, sports or to study. 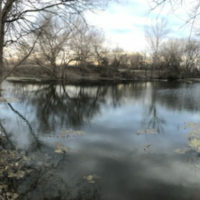 Activities that discourage interaction between the men, such as playing video games, are not allowed, although the group does enjoy watching Netflix or listening to music from time to time. They also love playing ultimate Frisbee in their front yard but said when basketball season begins, they are predicting they’ll hold basketball scrimmages instead. Saturdays are less structured and provide an opportunity for the men to practice prioritizing their time for prayer on their own. The men are focused on four pillars of formation in the program: human formation, apostolic formation, spiritual formation and academic formation. Within those four pillars, seminarians work on character building, prayer and do volunteer work. 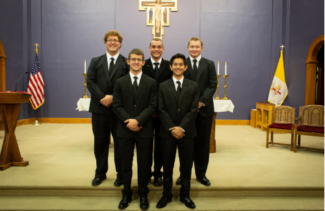 A goal for the seminarians this year is to do what they can to improve the campus atmosphere at Newman. Nguyen often plays Frisbee on campus with fellow seminarians and the group strives to attend as many events as they have time for. 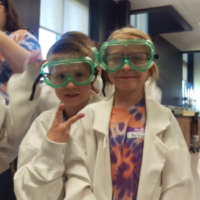 “It’s just so much more fun to be involved and have a good time and participate,” said Schneiders. With a history at Bishop Carroll High School and K-State, Schneiders craves more support and participation at events on campus, especially sporting events. The men have plans to support the Jets at nearly every home basketball game this season. For the seminarians, it’s all about prioritizing. They spend a lot of their day in prayer and plenty of their time studying but they make it a priority to attend events and create a more vibrant campus culture. If you happen to see seminarians on campus, just say, “Go Jets!” and you’ll get a very well practiced response. They’ve been working on a variety of unique cheers to use at the games this season. All in all, Nguyen and Schneiders want others to know that the seminarians are just normal human beings, like everyone else. Like any college student, the men look forward to their visits home and planning out their summers. Though their families are close by, the men are only allowed home once a month. As for summers, most choose to work odd jobs or take on religious positions, such as volunteer at Totus Tuus camp. As for their plans after seminary, that’s mostly up to the bishop, but both Schneiders and Nguyen are eager to make a difference wherever they go.